The Catholicos-Patriarch of All Georgia, Archbishop of Mtskheta-Tbilisi and the Metropolitan Pitsunda and Tskhum-Abkhazia Ilia II, gave an interview to the BBC Russian edition during his official visit to the UK last week. Interested in his new title, the BBC journalist asked Catholicos Patriarch how he can lead the diocese, which is not under Georgia’s jurisdiction? The Patriarch responded that the jurisdiction of the Georgian Orthodox Church extended to Abkhazia and Tskhinvali. It is recognized by the Russian Orthodox Church. “I was 11 years Metropolitan of Sukhumi and Abkhazia, and so I am very close to this diocese. I know the Abkhaz people, and I will visit Abkhazia in the near future as head of the diocese,” stated the Patriarch. The BBC correspondent asked the Catholicos Patriarch to recount his memories of the war days in Georgia in 2008 when he was personally involved in peaceful negotiations and went to the conflict zones during the August days. 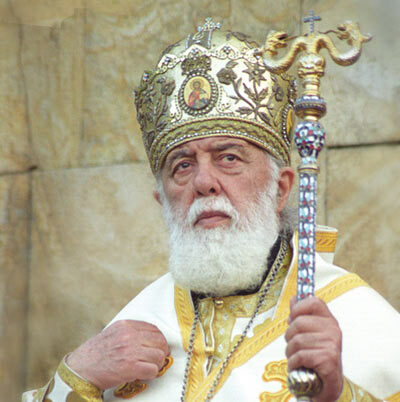 The Patriarch briefly described his visit to Gori and said that when he visited Gori, it was a dangerous time. “I was accompanied by two cars so the sniper did not shoot at me. We saw how our young people were killed in the field. I remember a car at the edge of the road – the driver was dead. We dragged him out of the car and took him to Tbilisi,” Ilia II recalled. As part of his visit to the UK, Catholicos-Patriarch met with Queen Elizabeth II. Speaking of the meeting, Ilia II said he had received a warm reception and added that Georgia strongly respects Her Majesty, the Queen of the United Kingdom. “It must be hard to be the neighbour of such a huge country [Russia],” Elizabeth II told the Catholicos Patriarch. Ilia II is visiting the UK at the invitation of Rowan Williams, the Archbishop of Canterbury.